Rex Wheeler in the studio with Central Pennsylvania Youth Ballet students Zoë Derauf and Adrian Durham. 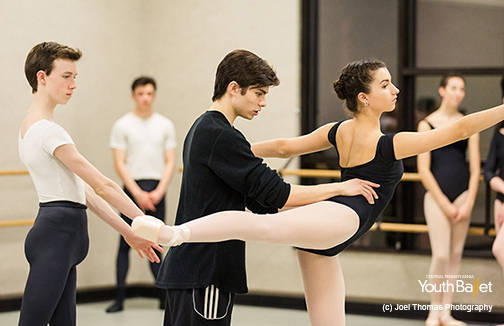 In the beginning, young ballet students are told exactly what to do. Each step on the road to flawless technique is strictly mapped out. But there comes a time when the dancer must soar, when technique is layered in the colors of artistry. At Central Pennsylvania Youth Ballet, this moment is nudged along when choreographers seeking new outlets are paired with young dancers eager to express their artistry through works made especially for them. It is all showcased in CPYB’s annual June Series, a four-day blend of classic works and, for 2017, new pieces from CPYB Director of Artistic Programming Alan Hineline and guest choreographers Rex Wheeler, Durante Verzola, and Amanda Edge. In rehearsals for Hineline’s “Jukebox,” dancers would enact their interpretations of what Hineline wanted to see, and he would select elements of his choreographic voice in the bits and pieces of each student’s unique stylization. Rex Wheeler has long tried to align his schedule with CPYB’s because CPYB, as a ballet school not affiliated with a company, is “a gem” of the dance world. “That stuck with me, not only seeing in myself how much I improved, but seeing the results the other students were able to get,” he says. Verzola’s childhood fascination with choreography emerged when he would corral his five younger siblings “and force them to rehearse and perform in front of my parents.” His “musically driven” choreography often finds expression in American pieces, like the “very quirky and fun and playful” Leroy Anderson piano concerto used in his June Series work. Hineline’s “Jukebox” features instantly recognizable songs from the 1950s and ‘60s – “Great Pretender,” “Only You,” “Dancin’ in the Streets.” It is not a story ballet, but a grouping of impressions that transform from grayscale to living color, just as television did in the 1950s and ‘60s, creating “something the audience will not only enjoy for the dancing and music aspects, but for the music that has the ability to transport you in time to a memory,” Hineline says. 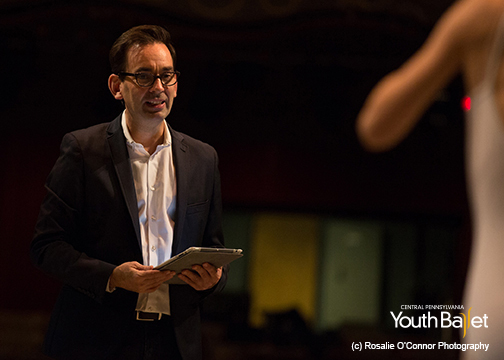 Hineline collaborated with CPYB board member Hugh Aberman on the selection of the music and development of libretto. For “Jukebox,” dancers were introduced not only to songs from before their time but to the unique dance steps of another area. 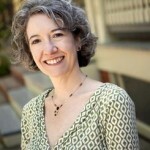 Experienced ballroom instructor Christy Kam coached students in swing, the Lindy, and other steps on the way to “developing this hybrid vocabulary, with ballet and the ballroom, into something that people haven’t seen and are excited by,” says Hineline. 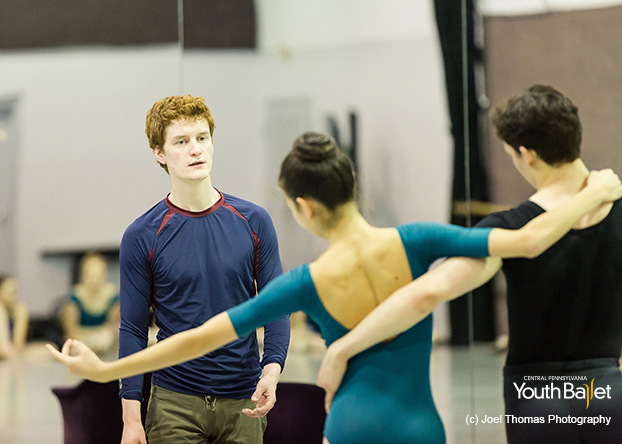 Durante Verzola in the studio with Central Pennsylvania Youth Ballet students Peyton Barnett and Finn Adams. For Verzola, the mentorship of Pennsylvania Ballet Founder Barbara Weisberger has encouraged and opened doors for him. His greatest joy in choreography is in “working with people and seeing them grow.” Future choreographers with “a voice that wants to be heard” should go for it, he says. Plus, he adds, CPYB and other schools that encourage new choreography are supporting the future of dance.